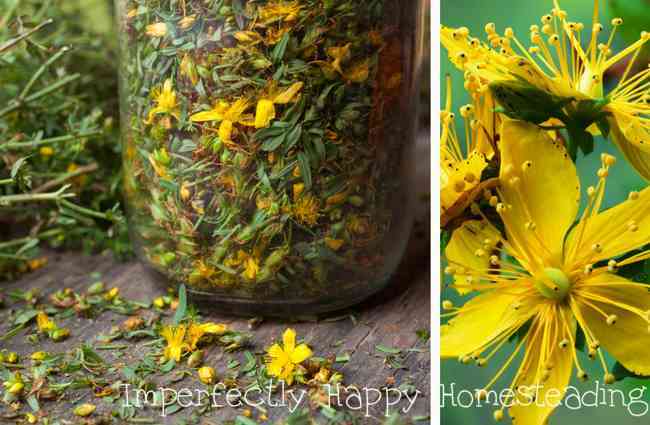 Growing and using St. John’s Wort on your homestead – the benefits, uses and precautions of this amazing herb. St. John’s wort is native to Europe and is often considered a weed in many area. Far from a pernicious weed, this herb has many benefits and is worth a considering for your homestead herb garden. St. John’s Wort, also called Hypericum perforatum is a perennial that grows well in full sun or partial shade. St. John’s Wort needs a rich soil to thrive; though you’ll find it grows very well and can quickly take over and area if not contained. You do not want this growing in an area where your pets or livestock has access to it. St. John’s Wort can be toxic to animals so plant with caution and a plan to contain it. You can start your St. John’s Wort from seeds or stem cuttings. Consider growing your St. John’s Wort in a container so that you can control its growth. You should know that a few states do not allow the plant to be grown and reputable seed companies will not ship there (California, Colorado, Montana, South Dakota or Washington). St. John’s Wort should be allowed to fully flower before your harvest it. The flowers are the coveted part of the plant but most herbal recipes I’ve used call for both the petals and leaves together. You can dry your harvest in a cool dry area, with no direct sunlight. Simply hang the stem with leaves and flowers attached for 7 – 10 days. You can also use a dehydrator if you really need the herb quickly; but it isn’t my preferred method. If you are in a state that does not allow for growing St. John’s Wort or you simply prefer not to do so, you can find it prepared and ready to use. According to Mountain Rose Herbs, St. John’s Wort was “considered a holy herb, St John’s Wort was employed for a number of folkloric uses during the Middle Ages. It was once believed that the herb helped to protect people from curses, demons, and lightning”. In our modern times, St. John’s Wort is used, primarily, to treat depression, anxiety and to support good mental health. There have been several studies showing its effectiveness in comparison to modern pharmaceuticals with very positive results. In fact, Germany uses this herb to treat most mild cases of depression. In addition to its mental health benefits St. John’s Wort is anti-inflammatory, anti-bacterial, anti-viral and has been used as a sedative, expectorant and astringent. It is said to benefit treatments of lung conditions, bladder issues and even diarrhea. St. John’s Wort is used, medicinally, in many ways: In teas, tinctures, lotions and salves, powdered in put into capsules. Check out Healing Harvest Homestead’s St. John’s Wort and Comfrey Salve. St. John’s Wort, while having amazing health benefits, should be used by more experienced herbalists. If you lack experience I highly recommend getting some assistance from your local herbalist or finding an online mentor that can school you fully on its use. The herb should not be used if you are currently taking medications, especially for depression or anxiety. And it goes without saying that you should never stop taking your medications without the supervision of a health care provider. However I do recommend finding one that will help you navigate its use in your treatment, if possible. You should note that taking and using St. John’s Wort can make you more sensitive to sunlight; precautions should be taken if you plan to use this on a regular basis.